This guide will walk you through building and testing an Automated Teller Machine (ATM) application with CanJS’s Core libraries. You’ll learn how to do test driven development (TDD) and manage complex state. It takes about 2 hours to complete. Notice it has tests at the bottom of the Output tab. Loads QUnit for its testing library. It also includes the <div id="qunit"></div> element where QUnit’s test results will be written to. Loads can.all.js, which is a script that includes all of CanJS core under a single global can namespace. Generally speaking, you should not use the global can script, but instead you should import things directly with a module loader like StealJS, WebPack or Browserify. Read Setting Up CanJS for instructions on how to set up CanJS in a real app. Includes the content for an app-template can-stache template. This template provides the title for the ATM app and uses the <atm-machine> custom can-component element that will eventually provide the ATM functionality. CODE - The ATM’s models, view-models and component code will go here. TESTS - The ATM’s tests will go here. Normally, your application’s code and tests will be in separate files and loaded by different html pages, but we combine them here to fit within JS Bin’s limitations. In this section, we will mock out which pages will be shown as the state of the ATM changes. Switch between different pages of the application as the ATM view-model’s state property changes with switch. Create the ATM view-model with a state property initialized to readingCard with can-define/map/map. Create an <atm-machine> custom element with can-component. When complete, you should see the “Reading Card” title. We’ll build out these pages once we build the Card and Transaction sub-models that will make building the ATM view model easier. Write out tests for the card. An ATM Card will take a card number and pin. It will start out as having a state of "unverified". It will have a verify method that will change the state to "verifying", and if the response is successful, state will change to "verified". Make the fake data request delay 1ms by setting delay to 1 before every test and restoring it to 2s after every test runs. Write a test that creates a valid card, calls .verify(), and asserts the state is "verified". Write a test that creates an invalid card, calls .verify(), and asserts the state is "invalid". When complete, you should have a breaking test. Now let’s make it pass. Implement the Card model so that all the tests pass. Simulate the /verifyCard with can-fixture. It will return a successful response if the request body has a number and pin, or a 400 if not. a number and a pin property. a state property initialized to unverified that is not part of the card’s serialized data. a verify method that posts the card’s data to /verifyCard and updates the state accordingly. When complete, all tests should pass. 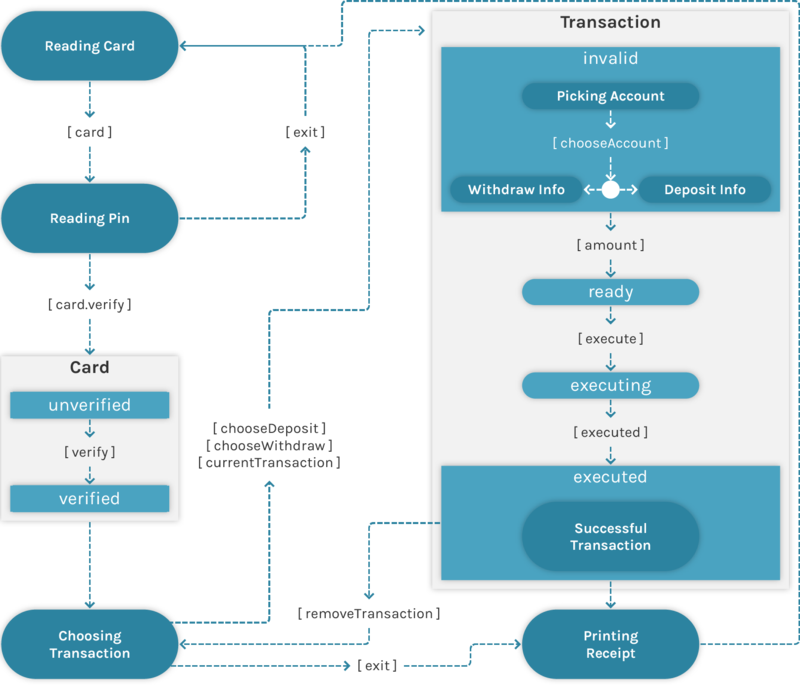 In this step, you implemented a Card model that encapsulates the behavior of its own state. Design an API retrieving Accounts. Design an API for a Deposit type. Write out tests for the Deposit type. An Account will have an id, name, and balance. We’ll use can-connect to add a getList method that retrieves an account given a card. A Deposit will take a card, an amount, and an account. Deposits will start out having a state of "invalid". When the deposit has a card, amount and account, the state will change to "ready". Once the deposit is ready, the .execute() method will change the state to "executing" and then to "executed" once the transaction completes. Create a deposit with an amount and a card. Check that the state is "invalid" because there is no account. set the deposit.accounts to the first account. "executed", verify the new account balance. When complete, the Deposit test should run, but error because Deposit is not defined. Optional: Challenge yourself by writing the Withdrawal test on your own. How is it different than the Deposit test? Implement a base Transaction model and extend it into Deposit and Withdrawal models. Get the Deposit test to pass. Simulate /accounts to return Account data with can-fixture. Simulate /deposit to always return a successful result. Simulate /withdrawal to always return a successful result. Define an Account.List type with can-define/list/list. Connect Account and Account.List types to the RESTful /accounts endpoint using can-connect/can/base-map/base-map. have account and card properties. have executing and executed properties that track if the transaction is executing or has executed. have a rejected property that stores the error given for a failed transaction. have an abstract ready property that Deposit and Withdrawal will implement to return true when the transaction is in an executable state. have a state property that reads other stateful properties and returns a string representation of the state. have an abstract executeStart method that Deposit and Withdrawal will implement to execute the transaction and return a Promise that resolves when the transaction is complete. have an abstract executeEnd method that Deposit and Withdrawal will implement to update the transactions values (typically the account balance) if the transaction is successfully completed. have an execute method that calls .executeStart() and executeEnd() and keeps the stateful properties updated correctly. implement ready to return true when the amount is greater than 0 and there’s an account and card. implement executeEnd to update the account balance. Define the Withdrawal model to behave in the same way as Deposit except that it POSTs the withdrawal information to /withdrawal. When complete, the Deposit tests will pass. Allow the user to enter a card number and go to the Reading Pin page. Add tests to the ATM Basics test. Allow a user to call cardNumber with the <input>’s value. Derive a state property that changes to "readingPin" when card is defined. Add a cardNumber that creates a card with the provided number. When complete, you should be able to enter a card number and see the Reading Pin page. Allow the user to enter a pin number and go to the Choosing Transaction page. Call pinNumber with the <input>’s value. Disable the <input> while the pin is being verified. Show a loading icon while the pin is being verified. Define an accountsPromise property that will contain a list of accounts for the card. Define a transactions property that will contain a list of transactions for this session. Update state to be in the "choosingTransaction" state when the card is verified. Define a pinNumber method that updates the card’s pin, calls .verify(), and initializes the accountsPromise and transactions properties. Test whether calling pinNumber moves the state to "choosingTransaction". When complete, you should be able to enter a card and pin number and see the Choosing Transaction page. Allow the user to pick a transaction type and go to the Picking Account page. Have buttons for choosing a deposit, withdrawal, or print a receipt and exit. Define a currentTransaction property that when set, adds the previous currentTransaction to the list of transactions. Update the state property to "pickingAccount" when there is a currentTransaction. Update the exit method to clear the currentTransaction property. Define chooseDeposit that creates a Deposit and sets it as the currentTransaction. Define chooseWithdraw that creates a Withdraw and sets it as the currentTransaction. Call .chooseDeposit() and verify that the state moves to "pickingAccount". Note: We will define printReceiptAndExit later! Allow the user to pick an account and go to either the Deposit Info or Withdrawal Info page. Write out a “Loading Accounts…” message while the accounts are loading. Write out the accounts when loaded. Call chooseAccount() when an account is clicked. Change state to check if the currentTransaction has an account and update the value to "depositInfo" or "withdrawalInfo", depending on the currentTransaction’s type. Add a chooseAccount method that sets the currentTransaction’s account. Call .chooseAccount() with the first account loaded. Verify the state changes to "depositInfo". Allow the user to enter the amount of a deposit and go to the Successful Transaction page. Ask the user how much they would like to deposit into the account. Update currentTransaction.amount with an <input>’s value. If the transaction is executing, show a spinner. show a Deposit button that will be active only once the transaction has a value. show a cancel button that will clear this transaction. Change state to "successfulTransaction" if the currentTransaction was executed. Add a removeTransaction method that removes the currentTransaction, which will revert state to "choosingTransaction". Add an amount to the currentTransaction. Make sure the currentTransaction is ready to be executed. Execute the currentTransaction and make sure that the state stays as "depositInfo" until the transaction is successful. Verify the state changed to "successfulTransaction". When complete, you should be able to enter a deposit amount and see that the transaction was successful. Allow the user to enter the amount of a withdrawal and go to the Successful Transaction page. Add a Withdraw page that works very similar to the Deposit page. When complete, you should be able to enter a withdrawal amount and see that the transaction was successful. Optional: Challenge yourself by adding a test for the withdrawalInfo state of an atm instance. Consider the progression of states needed to make it to the withdrawalInfo state. How is it different from the ATM basics test we already have? Show the result of the transaction. List out the account balance. print a receipt and exit the ATM (printReceiptAndExit will be implemented in the next section). When complete, you should be able to make a deposit or withdrawal, see the updated account balance, then start another transaction. List out all the transactions the user has completed. List out the final value of all accounts. Add a printingReceipt and receiptTime property. Change the state to "printingReceipt" when printingReceipt is true. Make .exit set printingReceipt to null. clears the current transaction, which will add the currentTransaction to the list of transactions. sets printingReceipt to true for printingReceipt time. Shorten the default receiptTime so the tests move quickly. Call printReceiptAndExit and make sure that the state changes to "printingReceipt" and then to "readingCard" and ensure that sensitive information is cleared from the ATM. When complete, you have a working ATM! Cha-ching!